Wave goodbye to backaches, neck pain and other discomfort caused by a day out on choppy waters. Whether you’re participating in a fishing tournament or planning a daylong pleasure cruise, you won’t have to worry about waves with our shock absorbing boat seat. 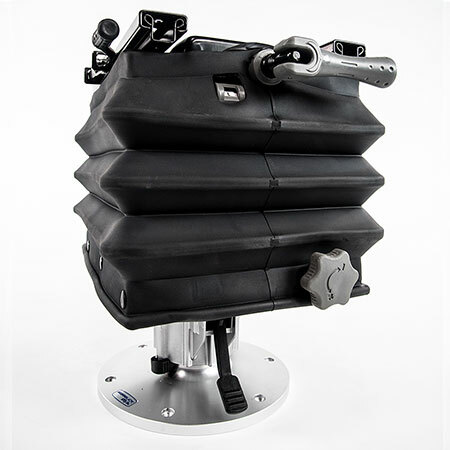 Unlike other brands’ air ride boat seats, the Smooth Moves Ultra is a hydraulic boat seat suspension, which means you won’t need an air pump, and you can easily adjust for a variety of passenger weights (100-300 lbs.). 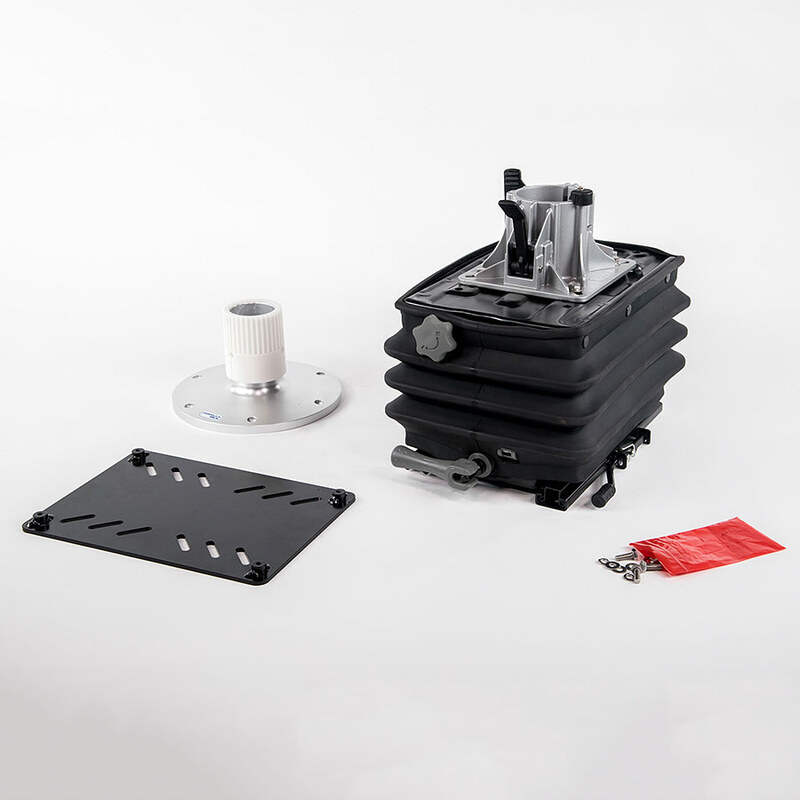 The Smooth Moves Ultra is incredibly durable and features salt water-resistant powder-coated steel, zinc-coated springs and a protective rubber boot. Smooth Moves suspension will fit in most fishing and pontoon boats with pedestal-style seat configuration, including HewesCraft, KingFisher, Warrior, Tracker, Nitro, Triton, Recon, Lund boats, Ranger boats, Crestliner, Alumacraft, Lowe, Skeeter, Starcraft, Smokercraft, Stabicraft and many other fishing boats. 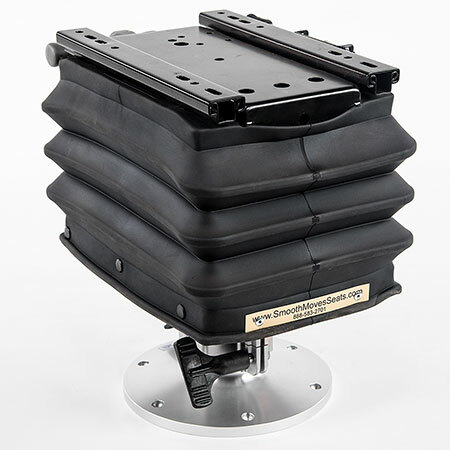 To determine which size pedestal to order for your Smooth Moves boat seat suspension system, measure from the bottom of the seat cushion to the floor of the boat. If under 12 inches, call customer service at 888-583-2701. 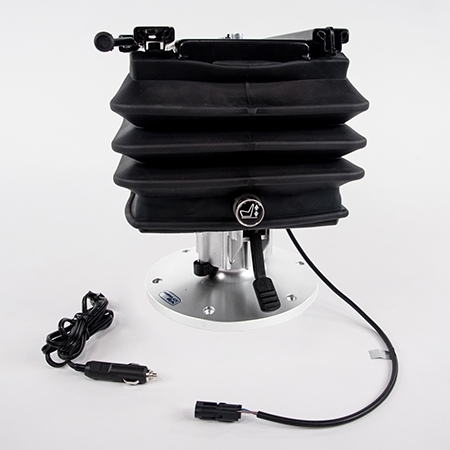 If between 12 and 16.5 inches, order the 4.75-inch pedestal. If it is 16.5 to 17.5 inches, order the 6-inch pedestal. If it is 17.5 to 19.5 inches, order the 8-inch pedestal. The small seat plate works with most seat configurations. 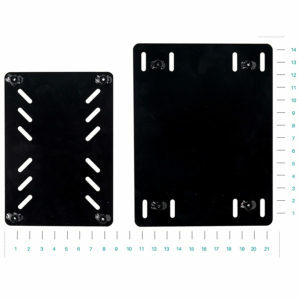 The large seat plate should be purchased for large upgraded or after-market seating, such as a captain’s chairs. Please call our customer service department at 888-583-2701 with any questions, and we will be happy to assist you in selecting the configuration that is right for your boat. I received my Ultra bases today. And wanted to say thank you. Very fast shipping and delivery. Very easy to install and seem like the best investment I’ve made in a long time. I was worried about height issues on my Ranger 620 but now installed see no issues at all Thanks again. Just wanted to give you some positive feedback on the Smooth Moves Ultra seats. I installed two in my 620, and we fished Erie this April in very difficult conditions. I had an 89-year-old man in my boat, and he never once complained about any jarring, and he raved about what a difference the seats made with the Smooth Moves on them. He said he would not have fished if not for those seats. I can do nothing but ditto his response—unbelievable in performance and the lack of jarring in 3-5 footers. Even going slow, you still get pounded, but these took all the jarring out. Excellent product. Just wanted you to know that. As usual, things just don’t go as planned, so my on-water testing didn’t occur until yesterday. OMG! Your Smooth Moves seat is AWESOME! We were out on Split Hand, and later in the morning the wind picked up, probably at least 15 mph out of the WSW, and there were 2-foot waves. I was like, this is perfect to test, and all I can say is THANK YOU. I felt like I was riding in a Cadillac, as the ride was as your name says, smooth! Bouncing up and down on it in the garage does not show what it is capable of at all. In the past when it was that rough, running from spot to spot was always a pain in more ways than one. I will no longer worry about my back when out on the water. Even so, the garage test did make the decision to get the second seat for my passenger a no-brainer. I have a buddy in town from Iowa, and he was amazed at how smooth it was when we were running across the water in those conditions. I had no idea what the seat would actually be like when I first ordered it, but it is a heavy well-built piece of equipment. I was a little worried about the price, but even without an on-water test, I could tell this was a winner, so I ordered the second seat. After the actual on-water experience and after only one on the water trip with the Smooth Moves Seats, I can tell you this is an absolute WINNER! I will be singing the praises of this product to anybody who will listen. I thank you, and my back thanks you for this great product! Immediately after installation I had a problem with my engine. As soon as it was fixed, I had the chance to test the suspension, yesterday. And what a difference!!! I was amazed how well it responded to waves, wow! I HAD A BIG SMILE ALL OVER MY FACE!!!! Saw your pedestal on show. Ordered one through Honey Hole tackle. Been using it now for a few weeks. Love it! Have ruptured disk in back. Thought I was going to have to get different style boat for smoother ride. Not now. Problem solved. Have friends interested. Easy installation. You got a winner here. Stick steering boats are very rough in bad waves. You sit at impact point. Thanks again. Hello, I purchased 2 Smooth Moves seats for my 209 yarcraft and love them. No more air rides blowing out. Best seat ever. I ordered 2 of your Ultra seats setups yesterday morning, and sometime today between 10 a.m. and 2 p.m., they were delivered. Outstanding service by you guys and the shipping company you picked, Fed-X. Thanks again. Just thought I would send you a note to say l received and have used our seat base, and she says it’s our best investment in a long time. My wife has a bulging disk and would not be able to go fishing in rough water if it were not for Smooth Moves seats. We were out this past weekend in 2′ plus chop, and she said it was great. I was slowing the boat down to ride the chop, and she asked why l was slowing down, so the seat must be good. I was a little reluctant at first on the purchase price due to our Canadian dollar, but after the weekend all is good. Very easy install and fast shipping. 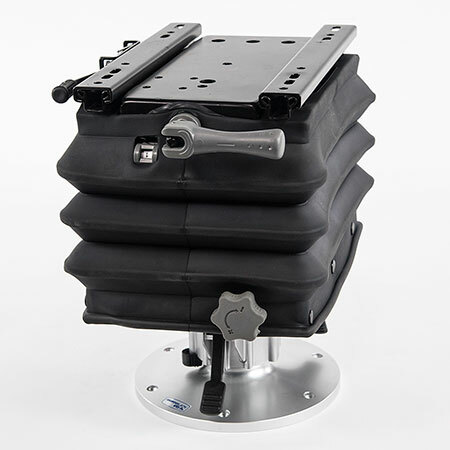 I would recommend this seat base to everyone. (A happy wife is a good life.) Thanks again. My home lake is Lake McConaughey in western Nebraska, and the wind is nearly always present. I love the easy ride I now get when I have to battle the waves. A great purchase! I love the seat. What a difference! The other fishing partner that was with me is sold on them too. He fishes a lot of open water and big lakes. Most likely I will be getting a second one too in the near future. I’m spreading the word about your products. I purchased 2 Ultras and tried them out last week, and they are awesome! First off, need to say that we simply love our Smooth Moves seats. Our second set and could not fish without them. So, thanks for a great product. 4 weeks ago, my wife and I had a rough ride on Lake Winnebago that really hurt our backs. I had an adjustable pneumatic pedestal I bought from my dealer a couple years ago, and it didn’t help in these waves. We were told about the Smooth Moves and decided to purchase them for both of us. I installed them 7-1-16. WOW!! These units are great! 7-4-16 we took our 18′ fishing boat from Oshkosh’s Lake Butte des Morts to Lake Winneconne, Lake Poygan and past Fremont on the Wolf River. 3 plus hours of riding from rough water to smooth. If you’ve ever taken this ride, you know the river gets really rough with all the big boat traffic. The Smooth Move seats worked great!! I just wanted to comment on my new Smooth Moves seats. For those of you that fish big water like Lake Oahe in South Dakota. My new seats allowed us to move locations in comfort. The conditions on day one of the South Dakota Gov. Cup were very tough with high winds and big waves. The install was easy. They take some adjustment at first, but that is also very easy. If you are considering new seats, I would highly recommend. 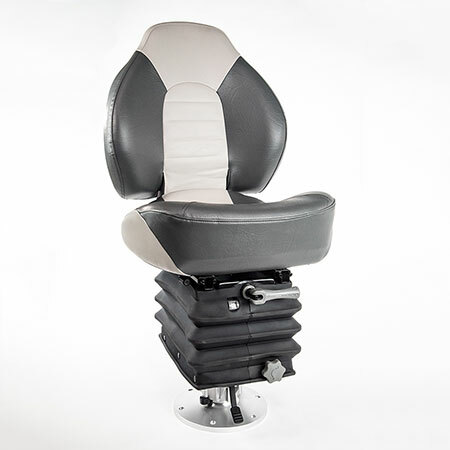 Just received my Smooth Moves seat mounts, and we love them. My wife has had back surgery, and the pounding of the waves were very uncomfortable. These mounts work great and are very easy to install. Thanks again. Over a 100 day on the water, and wouldn’t be with out my Smooth Moves. Thank you for a great product. Best investment I made for my Lund GL. My fishing season is over and boat put away. I have the time now to say thank you for a great product. My wife has had 2 back surgeries and was very near to not going out in the boat. After putting in 2 Smooth Moves this year, she has fished and boated in comfort. Saginaw Bay in Michigan can get very rough, and the seats have allowed us to fish longer and more often due to the comfort ride out and back. Thank you.